Protects against high voltage, surges/spikes and power-back surges. These conditions are harmful to electrical and electronic equipment. By disconnecting the power when it is bad, the TVGUARD safeguards against short term and long term damage to ensure higher efficiency from your appliances. 30 seconds start-up delay is built in to ensure stability of the power supply. The TVGUARD will disconnect the power to your appliance if the mains goes above a preset limit. The TVGUARD will re-connect automatically only after the supply has returned to acceptable limits after the 30 seconds wait time. The TimeSave™ function will ensure the TVGUARD provides maximum operation time to your appliance by having built-in intelligence to check the off time. If the unit has been off for more than 30 seconds, it will reconnect the mains within 10 seconds rather than the standard 30 seconds wait time. The iSense™ technology allows you to control how sensitive the TVGUARD is to voltage problems. Using the iSense™ dial you can set the desired level of protection. Are the TVGuard and HiVoltGuard similar in function? Yes, the two models are identical in function. Is your equipment in danger and you don’t even know it? 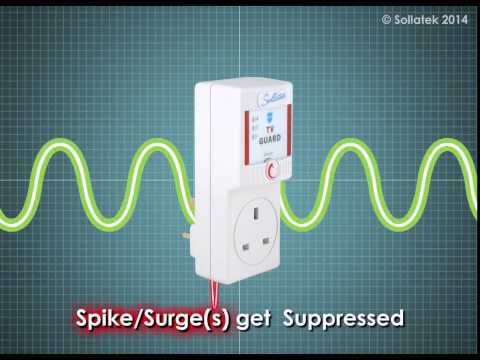 All electrical and electronic equipment, connected to the mains supply is at risk of being damaged from spikes, surges, lightning, power cuts, brown-outs, power-cuts (blackouts), power back surges, and over-voltage. The following is a summary of the main types of power problems, causes and how these affect electrical and electronic equipment.